entrance marked ‘DON’T OPEN: DEAD INSIDE’. fan art and immersive artwork, not for the faint of heart. return to screens this Monday at 9pm on FOX. A full Press Release is attached. 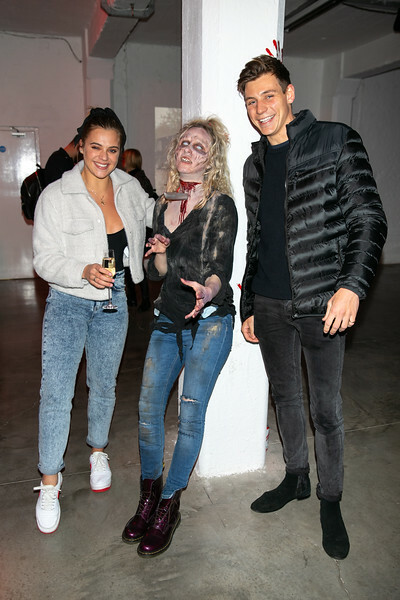 FREE FOR EDITORIAL USE - Laura Crane and Tristan Phipps attend The Walking Dead: Art Apocalypse. Art lovers and zombies, as actors in gory prosthetics swarm the entrance of the unique new art exhibition, open for two days (8-9 February) in Old Truman Brewery, Brick Lane, to celebrate the return of The Walking Dead to FOX at 9pm on Monday.